Hi ladies, it’s Anna from Fash Boulevard again. When it comes to braving arctic temperatures, investing in a sweater is paramount. The perfect style and fabric become even more important post-holidays, so keep your eyes open for sweaters that can transition from winter to spring. The moment I laid eyes on this preppy polka dot crewneck sweater from Paper Crown I was smitten. Not only does it possess the power to transcend seasons, but the jeweled stones add a punch of fabulousness to the collar and cuffs that can’t be ignored. When shopping for the ideal sweater, it’s important to pay special attention to the washing and care details. No one wants to be forced to gift their brand new sweater to their puppy. I have found that sweaters that hit mid-hip tend to be the most flattering. 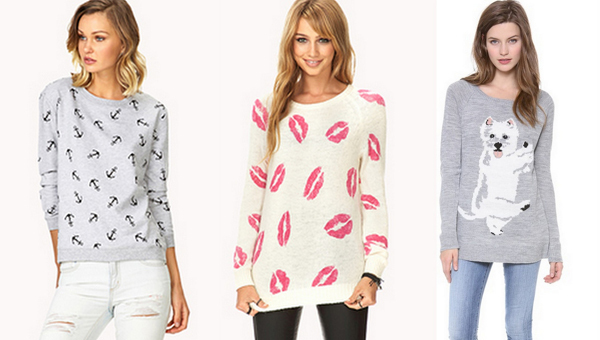 Longer sweaters also create a slimming look and oversized sweaters are super easy to find these days. Just make sure to stick with lighter fabric as we move into 2014. Do What’s Right for Your Body Type. Fear not about mixing your knits with other fabrics: Layering your oversized sweaters over thin slinky slip dresses is a stylish way to avoid your usual denim look. Everyone knows that cashmere sweaters are the cream of the crop… but they can also cost a small fortune. To cut costs, consider purchasing a cashmere blend. You’ll get the super soft feel you crave for half the cost. If you’re eager to rush into spring a few months early, visit Pantone to see their recently released colors of 2014. Pairing sweaters in spring-friendly hues with floral prints, like this vintage floral printed skirt from Paper Crown, makes for a transitional ensemble. Tuck your thin sweaters into your skirts and leave bulky knits un-tucked over a fitted skirt (think pencil skirt) like I recently did here. Pair any sweater with fitted bottoms to create the perfect proportion. 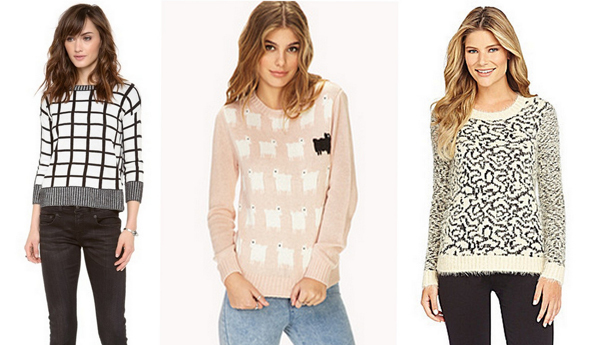 Which of these sweaters is your favorite?